EFA, IWB, IWM, RWR and TLT are available over the entire sample period. EEM is available starting April 2003. GLD is available starting November 2004. DBC is available starting February 2006. Results indicate that the SMA-derived constraints increase (decrease) the odds of picking equity-like (alternative class) assets, ostensibly because the equity market is in a bull state 72% of the time. There are only 33 of 119 months during which the alternative classes are in play. How do the two sets of winning ETFs translate into cumulative returns? Reallocate/rebalance at the close on the last trading day of each month (assume that five-month past total returns for the ETFs and the SMA-based equity market state can be calculated just before the close). Trading (switching) friction is 0.2% of the balance whenever there is a change in holdings. Ignore any tax implications of trading. 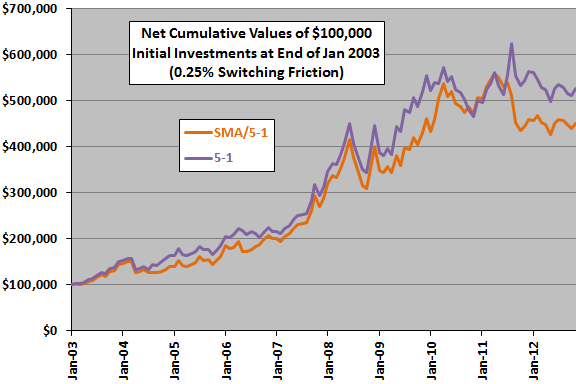 At the assumed level of switching friction, the 5-1 strategy beats the SMA/5-1 strategy based on terminal value and at most inception-to-date horizons. For comparison, the average monthly net return for the SMA/5-1 (5-1) strategy is 1.45% (1.58%), with standard deviation of monthly returns 5.79% (5.82%). 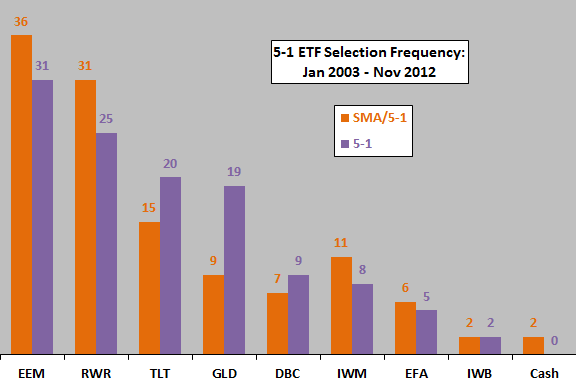 The number of switches for the SMA/5-1 (5-1) strategy is 42 (48), so reducing trading friction slightly favors SMA/5-1. On a frictionless basis, the average monthly gross return for the SMA/5-1 (5-1) strategy is 1.52% (1.66%), with standard deviation of monthly returns 5.77% (5.81%). If we initiate the test at the end of August 2006, when lagged five-month returns for all asset class ETFs first become available, the terminal value at the end of November 2012 for the SMA/5-1 (5-1) strategy is $246,364 ($262,122). In summary, evidence does not support belief that limiting choices for an asset class momentum strategy based on a simple equity market bull-bear state variable is advantageous. Sample size is modest (about 24 independent five-month momentum ranking intervals for five ETFs and fewer for three others, and about 12 independent 10-month SMA calculation intervals). There is data snooping bias in the selection of five months as the momentum ranking interval, and such bias is especially pernicious in small samples. It is plausible that a five-month interval is not separately optimal for the equity-like and alternative class assets. There may be ways to specify the equity market state that work better than the 10-month SMA for the S&P 500 Index. Potential wildness in ETF monthly return distributions limits confidence in results.